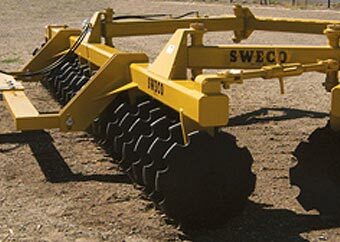 700 DISC HARROW – SWECO PRODUCTS, INC.
Like all SWECO products, the 700 Series Drag Type Offset Stubble Disc Harrow is constructed by a company that knows how to build durable farm implements. It is specifically designed as a rigged stubble disc. The main frame is made from 8˝x8˝x5/8˝ structural tubing to prevent cracking when the disc flexes under strain. SWECO’s bearing assemblies are mounted on trunnions that can pivot if the gang flexes. For a long, trouble-free life, all pivot points have large, hardened tension bushings with built-in high wear factor. The 700 also uses genuine SWECO hydraulic cylinders.